Over the past week, I've outlined about half a dozen reasons why the odds favor the bears should get another leg down after this rally, and now the market has finally entered the critical "retest" zone for the 1597 high. Elliott Wave is extremely particular about exact price points, whereas classic technical analysis allows a bit more leeway, and in classic TA, a "retest" is considered as something of a zone which extends somewhat below and above the prior swing high (or low). 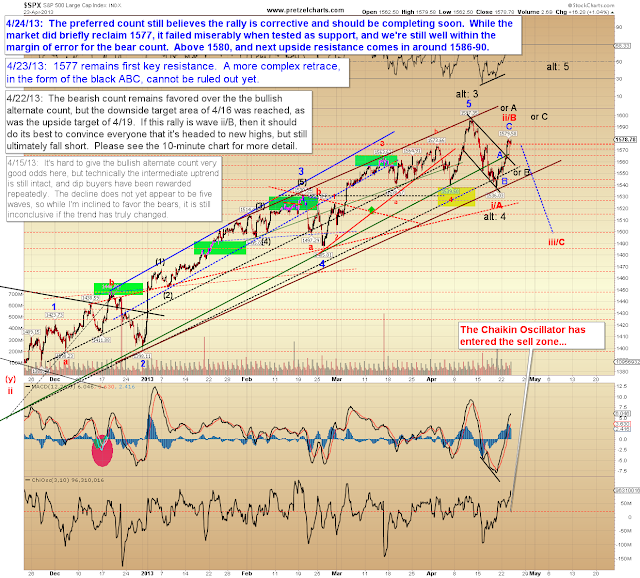 I tend to focus more on Elliott Wave analysis within this column, but in practice I blend the two disciplines. 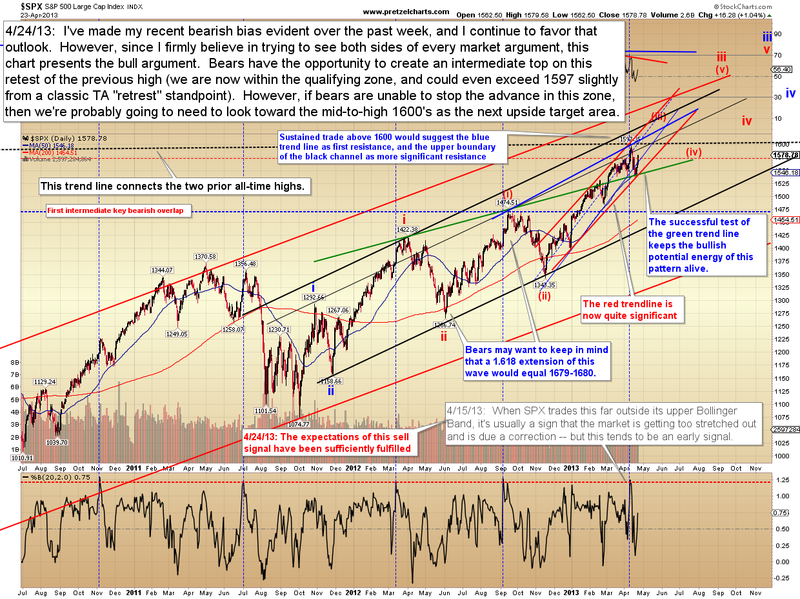 In either case, the market is now at an inflection point. Yesterday made for an interesting session, as the market experienced a mini flash-crash after AP had their Twitter account briefly taken over by terrorists, who sent out some frightening false news items. The market experienced several minutes of sheer panicked free-fall, when the terrorists falsely tweeted that Ben Bernanke had just been spotted reading a copy of The Road to Serfdom by Friedrich Hayek. But it recovered almost immediately, as investors quickly realized this Tweet was so incredibly unbelievable, it had to be a hoax. I think they also Tweeted something about explosions at the White House, but the market probably shrugged that off as irrelevant. On the one-minute chart below, there's an amazing little tidbit for those of you who love math and the harmony of the markets -- and it's especially interesting given the events of yesterday's session. On the chart below, the rally from blue B to blue wave (3) (from 1548.19 to 1560.18) is 11.99 points. 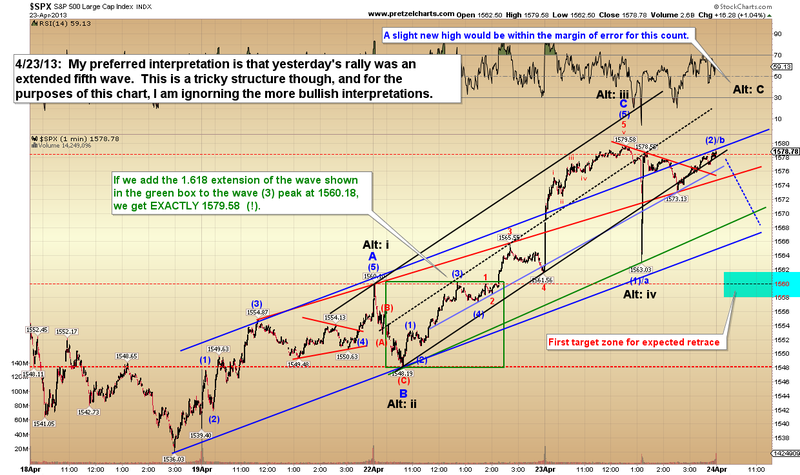 I am interpreting yesterday's rally as an extended fifth, and extended fifth waves often target the 1.618 extension of waves 1-3. Waves (1) through (3) were 11.99 points. 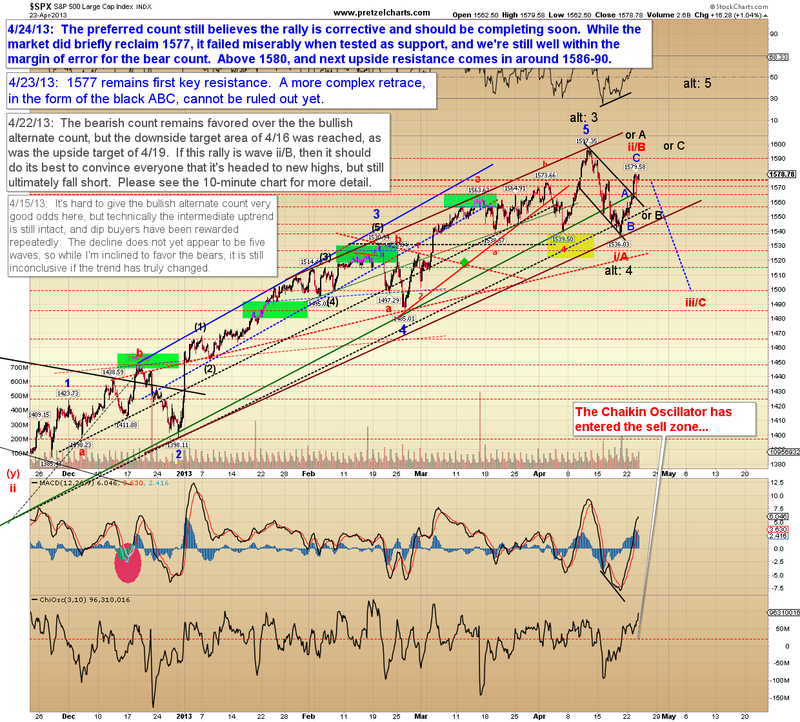 If we multiply that by 1.618 (the expected extension), it calculates to be 19.40 points. 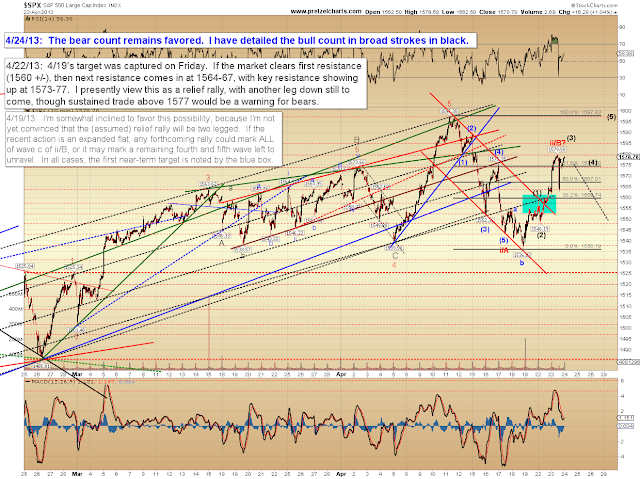 19.40 + 1560.18 (the peak of blue (3)) = 1579.58 -- which was the exact to-the-penny high of the wave before the flash crash. (Insert Twilight Zone music here...) I find this all the more fascinating given the "unpredictable" event in the form of terrorist activity and the market's subsequent 16-point plunge. 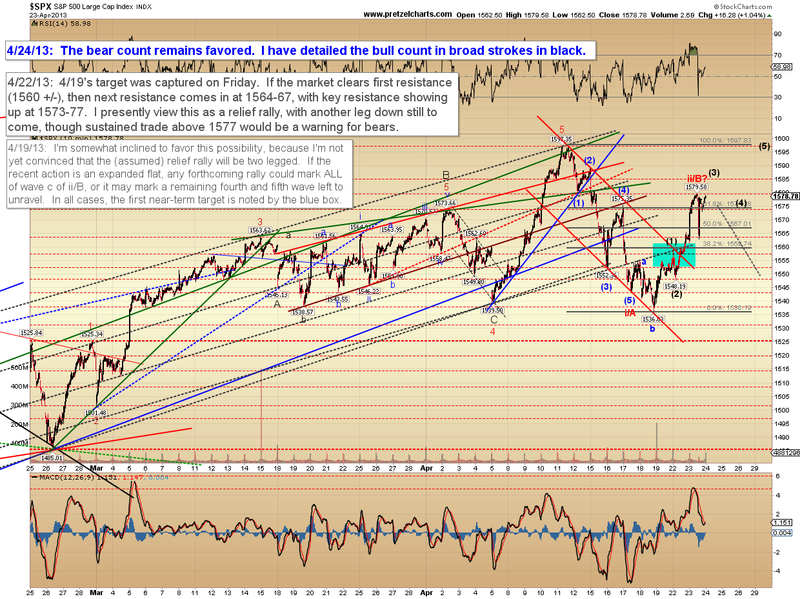 While I remain in favor of the bear view, the 10-minute chart shows the near-term bull count in rough detail. 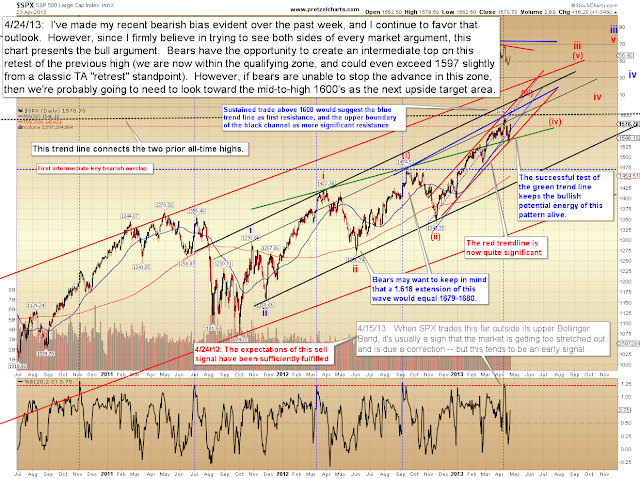 In conclusion, the market has still not deviated from the projection of more than a week ago, so there's as yet no reason to switch to a more bullish footing. The market's now reached the inflection point, so what happens in the next few sessions should give us a great deal of information. Trade safe.